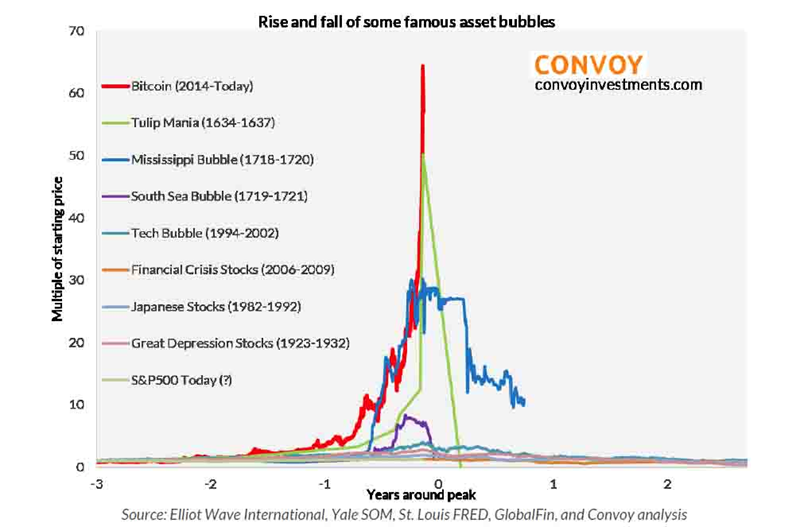 It's official: According to a price analysis from Convoy Investments that went viral this week, the rise of bitcoin has overtaken Tulip Mania of the 1600s and the Mississippi Bubble of the 1700s to become the largest asset bubble in world history. This as futures exchanges start trading contracts on the cryptocurrency. The stalwarts will argue that bubble status is assigned retrospectively—only after a price collapse that may or may not come. To my ears, this sounds like a variation of "It's different this time," given that bitcoin has so many of the characteristics of previous manias: Perceived scarcity wrapped in the veneer of "the new" and enabled by low interest rates, animal spirits, and excess monetary liquidity. From the South Sea Bubble to Beanie Babies and McMansions in Phoenix circa 2006, the similarities are striking. Bitcoin's euphoric rise has spread into other "altcoins," pushing up the value of Ethereum and Litecoin. Ask the regular Joes diving into cryptocurrencies what the difference is between these, standard bitcoin and the various bitcoin forks like Bitcoin Cash, Bitcoin Gold and Bitcoin Diamond. Price is creating the excitement, especially in Asia where the bulk of bitcoin trading is occurring. Not any in-depth discussion on statement-of-work vs. proof-of-stake, tepid retailer adoption, or how price volatility undermines bitcoin's original intent to be a government-less currency (which by definition, requires value stability to be successful). Have things come too far too fast? Bitcoin's price rise has been so swift and severe that even bitcoin insiders are joining with regulators and other officials to warn of the downside risks. The acting head of New Zealand's central bank, Grant Spencer, said bitcoin resembles a classic bubble thanks to a super-exponential price rise. SEC chairman Jay Clayton on Monday reminded speculators that cryptocurrency markets, by design, offer less investor protections than the traditional securities market because of their decentralized, supranational nature (a "feature," according to its proponents). Coinbase founder Brian Armstrong wrote in a blog post that bitcoin prices are volatile and that folks should "invest responsibly." Mike Novogratz, a famed hedge fund manager turned crypto-investor, called it "the biggest bubble of our lifetimes." Even the founder of Litecoin told potential buyers Monday night that buying his currency is "extremely risky" and that he expects to have a multi-year bear market where its value could drop 90%. The "dumb money" is pouring in. Coinbase has more accounts than Charles Schwab, a threefold increase over the past year to more than 12 million. Bitcoin-related terms top Apple's App Store search, while Google Trends finds a fourfold increase in bitcoin searches since Thanksgiving. CNBC reported that a Dutch family sold their house, cars and other possessions, and then moved to a campsite, intending to live off of crypto trade winnings. The intense interest is revealing the limitations of bitcoin's infrastructure, with transaction fees soaring and transaction backlogs persistent. Can external costs be paid? "Digiconimist" produced a widely-cited projection of bitcoin energy consumption, and, at nearly 90 million kWh used per day, bitcoin mining hardware consumes roughly the same amount of electricity as Denmark. A single bitcoin transaction—which currently can take up to 22 hours to settle—uses as much power as eight American homes in a single day. If the current growth rate in power consumption continues, by February 2020 the bitcoin network will consume as much power as the entire world does right now. Compare this to the Visa credit card network, which uses 5,000 times less energy. And what about forgone taxes on bitcoin winnings? The IRS has successfully sued Coinbase to get access to 14,000 user accounts in an effort to close the gap between the mere hundreds of citizens who have declared cryptocurrency winnings on their 1040s and the millions who are trading it. South Korean officials recently held an emergency meeting to consider taxing bitcoin capital gains. What problem does bitcoin solve, exactly? There are two qualities here that are often intermingled: bitcoin's transaction system (anonymous, peer-to-peer, unregulated), and its value as a store of wealth (driven by scarcity, platform access and optimism about the underlying technology). Both value propositions are undermined by bitcoin's extreme price volatility and concentration in the hands of a relatively small number of users, with GMO's Edward Chancellor noting that some 95% of bitcoin is held in just 4% of accounts. There is no intellectual property protection moat, nor any limitation on the creation of new competing cryptocurrencies, and there are frequent "hard forks" that risk undermining the impression that bitcoin is the cryptocurrency for the future. Moreover, what exactly is wrong with the current global financial system? It's not the first attempt, with experiments in non-Fed bank issued currencies, metallism in various forms, and Treasury notes giving way to our current setup. Instead, Satoshi envisioned a direct digital peer-to-peer system that mimicked the hand-to-hand way cash is used. Only it wouldn't be denominated in US dollars. Thus, not only would it cut the banking system out of the loop but the US Federal Reserve as well. But despite the need for a capital injection by the government—shoring up bank balance sheets from losses on mortgage securities—the system survived. As long as investors remain confident in the creditworthiness of the US Treasury, the banking system will have a resolute backstop that's hard to argue with. Especially if you're among those who lost real money in the myriad of bitcoin-related hacks or scams. As for payments processing, I don't see the benefits in terms of ease of use, cost, safety and validation between a bitcoin transaction and something like a Visa swipe, an ACH transfer or even PayPal. Bitcoin is even less suitable for small transactions, like buying a cup of coffee, as new competitors like Apple Pay messaging and Zelle move in. 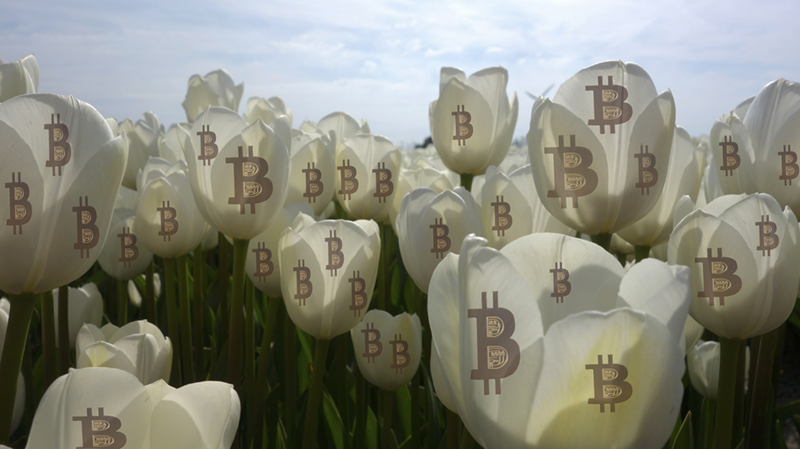 Can bitcoin survive a counterattack by 'The Establishment'? The single largest risk to bitcoin is a regulatory crackdown not unlike what happened in China, which was until then the global hotspot for bitcoin activity. The government has a long history of outlawing economic and financial market activities not deemed in the common interest, from "bucket shops" that allowed people to make highly leveraged bets on the direction of stocks and commodities at the turn of the 20th century to the prohibition on the private ownership of gold during the Great Depression. But above all, bitcoin's rise is a product of the post-crisis era of ultra-aggressive cheap-money stimulus. In-built scarcity (only 21 million will ever be mined) and a peer-to-peer nature offering a free-market refuge from Wall Street, fiat money and the central banks? That's a role that used to be played by precious metals. Yet a sea change is coming. The Federal Reserve has been tightening monetary policy for two years, with another rate hike announced this week and another three hikes of 0.25% penciled in for 2018. Inflation is picking up amid labor market tightness, the latent effects of global monetary easing and the looming passage of a simulative GOP tax cut bill in Washington—suggesting that further policy tightening is coming. A hawkish Fed would likely lead to a rebound in the US dollar, a breaking of the speculative fever on Wall Street and an undermining of many of the reasons bitcoin was created in the first place. When that happens, I expect bitcoin to fall to its intrinsic value, which at this point is the cost of mining a new coin. According to JPMorgan, that's just $800. Am I wrong? Tell me why.